Want a dessert that looks & tastes decadent but is secretly healthy? 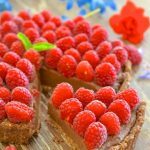 I've got you covered with my decadent but Healthy Raspberry Chocolate Fudge Tart. Gradually add the water. Start with 5 tablespoons and process again for a minute or two then open and try to squeeze the mixture together in your hand. If it stays together easily then it's done. If not add one to two more tablespoons of water then process again. It should press together easily but not feel very wet. Tip the mixture into the tart pan and press down with your hands across the bottom and up the sides evenly. Prick the bottom all over with a fork then line gently with parchment paper. Fill with pie weights or dried beans/rice. Bake in the oven for 20 minutes then remove the weights and paper, return to the oven and bake for another 10 minutes. Add all ingredients to the food processor (no need to clean it as it was only used for the crust) and process until completely smooth, stopping to scrape down the sides once or twice. Make sure it is really, really smooth. Spoon the chocolate filling into the pastry case and level the top. Decorate with raspberries then refrigerate until the filling is firm. It doesn't take too long. One to two hours max. Use a tart pan roughly 8 - 9 inches in diameter (or you could use mini pans). If you don't want a hint of coconut in the overall flavour use refined coconut oil rather than Virgin.or unrefined coconut oil. Will keep well for up to one week in the fridge.